RBSE 10th result 2018 LIVE: Rajasthan Board of Secondary Education (RBSE), Ajmer has declared scores by the board on the official website - rajeduboard.rajasthan.gov.in and rajresults.nic.in. Besides the official websites, students can also check the results on third party websites such as indiaresults.com and examresults.net. RBSE 10th result 2018 LIVE: The results for class 10th examination conducted by Rajasthan board are announced by Rajasthan Board of Secondary Education (RBSE), Ajmer today. RBSE 10th result 2018 LIVE: The results for class 10th examination conducted by Rajasthan board has been announced by Rajasthan Board of Secondary Education (RBSE), Ajmer today. The scores were declared by the board on the official website – rajeduboard.rajasthan.gov.in and rajresults.nic.in. Besides the official websites, students can also check the results on third-party websites such as indiaresults.com and examresults.net. The exams for RBSE Class 10 were conducted from March 15 to 26, 2018 in which around 11 lakh students appeared for the paper. RBSE conducted the Class 10 and Class 12 examinations earlier this year from March 8 and the exams for secondary and senior secondary classes were continued till April 2. The examination took place under strict vigilance by the board. To curb any malpractice, the RBSE or BSER had installed CCTV cameras at around 300 sensitive and very-sensitive examination centres across the state. To maintain law and order during the exams, over four thousand police officials were also deployed at the centres. Also Read| Rajasthan Board RBSE 10th result 2018 Student Alert! Last year in 2017, the result of SSC or RBSE 10th examinations were declared in the month of June. Previous year, Boys had outperformed girls by scoring 79.01 per cent. While the pass percentage of girls stood at 78.89. Here is how students can get admission in class 11? Students, after clearing 10th exam may apply for the schools located in Rajasthan. They may also choose the streams i.e. science, commerce and arts according to their choice. The class 11th admission depends on performance in 10th exam. The school release the merit list for science, commerce and arts. Students can take admission on the basis of the merit list published by the school. Students are required to fill the admission form given by the school. Around 79.86 percent students cleared the exam this year. Of them girls passing percentage isis 79.95 and for boys passing percentage is 79.79. Rajasthan minister Vasudev Devnani today announced that passing percentage in government schools has increased by 1 percent this year. In 2017, the passing percentage was 76.04 percent on government schools. The board has decided to award outstanding students of Class 10 who did well in 2016 and 2017. As many as 16 students got gold and 263 got silver medals. Nine students of 2016 and seven from last year's batches were honoured with gold medals. The board has decided not to announce any merit list since last year. The decision was taken as the board was facing problems with the system. ir felt that announcing merit list was putting too much pressure on students. This year, the performance of private schools were better than government schools. While passing percentage in private school is 83.31 percent, in government schools, passing percentage is 77.01 percent. * Students can now download result and also take a printout for further use. Students looking to check their results can do so through apps that are available at google play store. Students can also pre-register their roll number to get results through app. Earlier results of Science, Commerce streams were announced on May 23. This year, as many as 33564 students flunked the board exam. The result for Rajasthan Praveshika Pariksha (Rajasthan admission test) has also been announced. The passing percentage is 62.51. 61.56 percent boys and 63.32 percent of the girls, who passed the Rajasthan entrance examination. The board had declared results of class 12 Science and Commerce on May 23 and Arts stream on June 1. Close to 88.92 per cent students passed the examination successfully. While91.46 percent passed the exam, boys boys passing percentage was 86.67. Apart from the year 2015, boys have constantly done better than girls.That year, girls got 0.54 percent more than boys. Last year as many as 10,99,000 students gave the exam. In 2015-16, close to 9.32 lakh students appeared for the exam. The pass percentage was 92.73 percent. There has been a slight improvement in the results of government schools this year. The results of the students have improved by 1.5 percent, according to report. The marksheet for RBSE class 10th examination results are now available on the official websites - rajresults.nic.in, rajeduboard.rajasthan.gov.in. Students who had appeared for the same can check their respective scores now. If due to heavy traffic one is unable to open the above-listed websites, he/she can also check their results at examresults.net and indiaresults.com. How to get admission in 11th class? After passing class 10th class examination, students can apply for the schools located in Rajasthan. They may also choose the streams, i.e. science, commerce and arts as per their choice. The admission to the 11th class completely depends on your performance in 10th exam. The school release the merit list for science, commerce and arts streams. Students can get admission on the basis of the merit list published by the school. Students have to fill the admission form given by the school separately. RBSE 10th result 2018: COUNTDOWN Begins! The Results for the much-awaited class 10th board examinations are going to be declared anytime now! State Education Minister Vasudev Devnani will announce the result. This year 10,82,972 students had registered for the 10th board exam. 7042 students had registered for Rajasthan Praveshika exam and 31,592 students ahd registered for Rajasthan Madhyamik Vyavsayik (Vocational) exam. Rajasthan board awards meritorious students of Class 10 every year. In last two years, 16 students received gold and 263 got silver medals. While, nine students of 2016 and seven of 2017 batches were awarded gold medals. The pass percentage is expected to improve this year, unlike the previous year when the overall pass percentage of Class 10 was 78.96 per cent. The results will be announced in a short while. Students are advised to keep their roll numbers ready. Stay tuned to this section for latest updates on RBSE 10th result 2018. In the year 2017, a total of 10,72,799 students sat for the exam. Out of the total 4,83,282 were boys and 3,63,781 were girls. Last year, the result of SSC or Class 10 examinations were declared in June itself and then, boys had outperformed girls by scoring 79.01 per cent. While girls scored a little less with 78.89 per cent. The overall pass percentage of Class 10 was 78.96 per cent. The exam for secondary and senior secondary classes that started from March 8 was continued till April 2, this year. However, the board this year took some strict measures to curb any malpractice. As per the report, te RBSE or BSER installed CCTV cameras at around 300 sensitive and very-sensitive examination centres across the state. Over four thousand police officials were also deployed to maintain law and order during the exams. The students can also check the results through other apps available at the google play store. To get the results via app, candidates have to pre-register their roll number. The results for RBSE class 10th board exams will be announced in another one hour. This year the board will not release the merit list. The board recently announced results of RBSE Class 12th Science and Commerce and Class 8 examination on May 23 and June 6 respectively. According to report, a total of 6.87 lakh Class 8 candidates managed to clear the exams. While around 88.92 per cent students cleared the examination successfully who had appeared for Arts stream of Class 12 examination. The girls had scored 91.46 per cent while boys scored a pass percentage of 86.67. Around 11 lakh students appeared for the paper that took place from March 15 to 26, 2018. Besides the official website, the students who had appeared for the exam will also be able to get access to their scorecards through the third-party websites such as indiaresults.com and examresults.net. 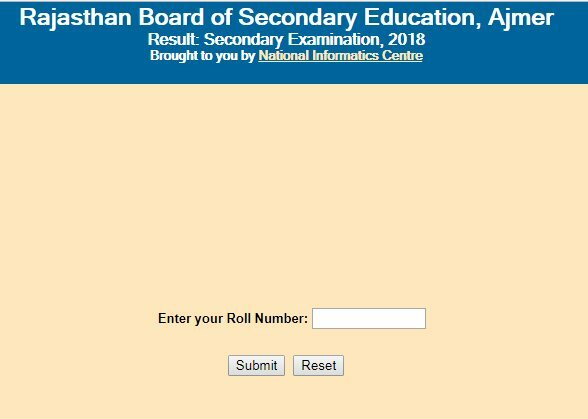 Board of Secondary Education, Rajasthan (BSER) notified on Sunday that the state board will release the scorecards on June 11 on the official website - rajeduboard.rajasthan.gov.in and rajresults.nic.in. The board also mentioned the exact time of result announcement as 3:15 pm. Students who have appeared for the exam and were eagerly waiting for the results will be able to check their scores on the given website once declared. Rajasthan Board will declare the RBSE Madhyamik Result 2018 today. The board confirmed the date and time of release on Sunday, June 10 that it would announce the scores at 3:15 pm on rajresults.nic.in on Monday. The board results will be announced by the State Education Minister. The Board of Secondary Education, Rajasthan (BSER) conducts the Rajasthan Board Class 10 exams every year and this year the Rajasthan Board conducted the RBSE Class 10th exam from March 15 - March 26, for which the results will be declared today on the official website. Once the results are announced, the students will be able to check the result by logging to the official website rajeduboard.rajasthan.gov.in. On the website, look for the link which says Rajasthan Board Class 10 results 2018, RBSE Class 10 result 2018 and click on the same. Enter the required details, click on Submit. Download the Rajasthan Board Class 10 result 2018 and take a printout for future reference. The results of Rajasthan Board of Secondary Education (RBSE) Class 10 examination will be declared today. The result will be available at the official websites, rajeduboard.rajasthan.gov.in, rajresults.nic.in from 3:15 pm onwards. RBSE 10th result 2018: Rajasthan Board declared the RBSE Madhyamik Result 2018 today. The board results were announced by the State Education Minister. All students who have appeared for the exam and were eagerly waiting for results can now check their scorecards on the official website -rajeduboard.rajasthan.gov.in and rajresults.nic.in. 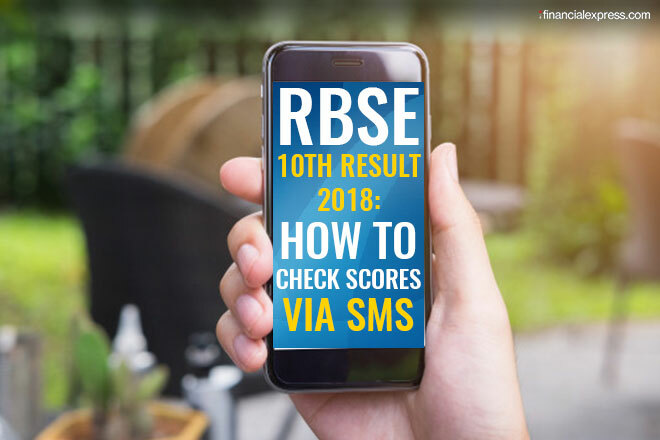 RBSE 10th result 2018: All students who have appeared for the exam and were eagerly waiting for results, can check their scorecards on the official website -rajeduboard.rajasthan.gov.in and rajresults.nic.in.Board of Secondary Education, Rajasthan (BSER) is a state agency of the Government of Rajasthan that looks after school level education in the state. It has its headquarters in Ajmer. Board is responsible for promotion and development of secondary education in the state of Rajasthan. Set up in the year 1957, BSER was constituted under the Rajasthan Secondary Education Act 1957. Results of examinations conducted by BSER can be accessed via the website.